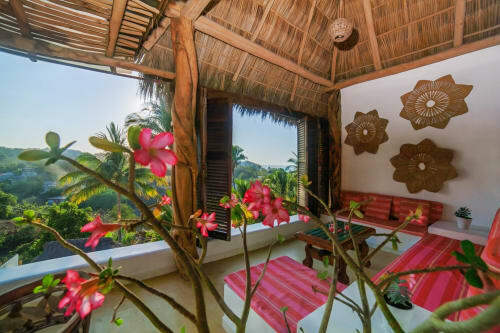 Casa Vecino Retreat Center in Sayulita is located in a quiet south side neighborhood within walking distance to everything. It is a short five minute, four block walk to the plaza and a 5-10 minute walk to the beach. Perfect for yoga or business retreats and wedding parties, the Casa Vecino Retreat Center can comfortably accommodate groups of 12 in 6 bedrooms and 4 additional guests when utilizing the built in sofas in living rooms for additional sleeping space. Spacious ocean view rooftop terrace with pergola shade structure perfect for yoga or fitness classes. 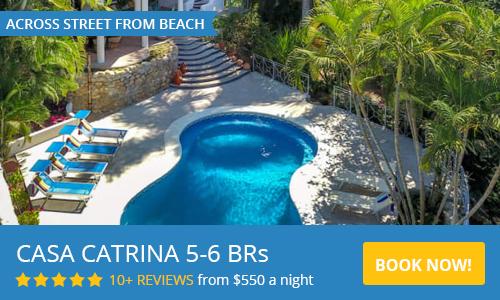 The best place to stay in Sayulita! Gabe and Wendy are Extremely Kind and are some of the Best People I have ever met. Casa Vecino is Immaculate . Easy walk to town and the beach. Gabes knowledge about resturants and entertainment in Sayulita is top knotch. A true little oasis! The roof top patio affords amazing views and hammocks are perfect. The rooms are beautiful, the beds are comfortable and the pool and surounding area is very tranquil. Truly a home away from home. On top of all that he also facilitates an animal rescue and adoption program for the strays in the area (true animal lovers) they are part of the reason my wife Hollie and I have fallen in love with Sayulita. They are living the dream life that my wife amd I wish we could and on top of that they share a little bit of that dream with all there guests. I seriously could go on forever about how great Gabe and Wendy are but I'll spare you all the gushing (because I don't sound like a stalker 😉) Do yourself a favor and book with Casa Vecino for you vacation in Sayulita. You will not be sorry. Wonderful accommodation & very lovely hosts! We couldn't be happier with our 6 night stay at Casa Vecino. Gabe welcomed us at the door with a smile and showed us to Casita Luna - our one bedroom unit. The layout was fantastic! Large kitchen & lounge area in the front, and a very spacious bedroom with ensuite bathroom in the back. We spent time on the roof top patio everyday, enjoying our morning coffees, afternoon cervezas & evening beverages. Bonus! There is a ping pong table up there so we played a few rounds while admiring the jungle & ocean view. The wifi speed was impressive! I had a bit of work to do on our first day there, and was able to skype with my colleague while sitting on the roof top patio. It rained a couple days while we were there, and we had no problem watching a few Netflix shows. It was a pleasant surprise. Big thanks Gabe & Wendy for being such great hosts, and creating such a comfortable home away from home. 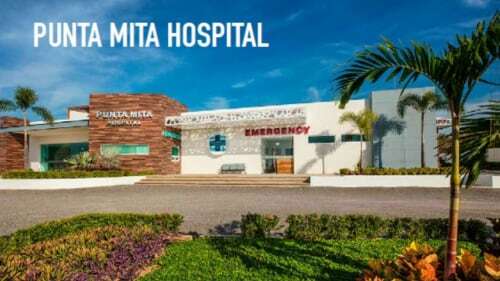 Wonderful modern and comfortable apartments and casitas. Great location. This was my first time staying in the south neighborhood, and it was an incredible experience. Only a 5 minute walk to the downtown area and beach. It was quiet and felt very safe at any time, day or night. The casa has a wonderful pool (kept at a pleasantly cool temperature). There was lots of privacy in the casa and in our apartment. There's a really cool rooftop communal area with amazing views and furniture to relax on. Inside our apartment, we had a surprisingly well-equipped kitchen, and a closed-off bedroom with AC so it stayed nice and cool. Out our front door there was a nice covered deck/patio with a table and some chairs and a really nice view. The whole property is recently built and nicely updated. The owners are not only incredibly attentive, they are just genuinely nice and sincere people. They were willing to help out with any of our random questions and made some great recommendations. Even though they are originally Canadian, they are as good as Sayulita locals at this point, and know all the best restaurants, surf shops etc. Both are a wealth of information. They were happy to leave us alone and enjoy ourselves, or happy to share some beers and stories together. Of all the casas I've stayed at in Sayulita, this one offered the most unique experience, while also having all the normal amenities that I look for. A whole tribe of us took over Casa Vecino during my daughter Emily's wedding week. One night prior to the wedding, we threw a welcome party for 30 people on the Casa's rooftop deck. Gabe couldn't have been more helpful, giving me good recommendations and contact info for caterers, meeting with the wedding planner who was arranging for rental dining furnishings, lending us his coolers, bar and personal golf cart for people transport, even helping us haul the furniture up four flights of stairs to the top deck! Now that's customer service! I think 30 people was the perfect size for the space but you could probably accommodate even more with bar tables rather than regular seating. Gabe truly cared about the event being a great success ... and it was. Such a beautiful setting for a wonderful event!